9 weeks until Christmas – still time to lose a stone! Do you know it is just 9 weeks until Christmas! I don’t know about you, but it seems to come around much more quickly these days. But there’s still time for you to shake off those excess pounds before the big day and lose weight for Christmas. Imagine how you’d feel if you lost those extra few pounds. Or if it’s “more than a few pounds” wouldn’t it be great to be well on your way by Christmas. Imagine how it’d be when your friends and family say how great you look! Imagine getting into that special outfit! … And imagine how much better you’ll feel about yourself – fitter, healthier and more confident! You can do it, you know. The Slimtone Lifestyle Plan has everything you need to shift those unwanted pounds – and I’m with you every step of the way with answers to your questions, tips to make things easier and encouragement to help you get there. Let’s have a look at how you can shape up for the festive season. First of all, semi-starvation won’t help – it’ll just get you down. Instead of just thinking about losing weight for Christmas, grab your Lifestyle Plan and highlight all your favourites. Get organised with your menu plan and sort out your shopping. Have a cooking session and make a selection of your favourite meals then freeze them. You’ll find it so convenient to have a meal ready whenever you need it. Make up your Slimtone Soup too, (the recipe is on page 27 of the plan) it’s ideal as a snack or as a calorie-free starter before a meal. Take it to work in a soup flask to have with your packed lunch and you’ll have a really satisfying meal. Next think about your portion size. If you guesstimate your portions instead of weighing them then you are NOT following the plan. Just the odd piece of cheese or chocolate or nibbling at the children’s leftovers has calories and they all count. Remember the Slimtone motto – Little Pickers Wear Bigger Knickers! C’mon now, no messing, no guessing! Here’s something that lots of our members have to face up to – what I buy I eat! You’ll be able to resist those “Christmas biscuits and chocolates and cakes” much more easily if they are not in the house. Saying NO at the supermarket is much better than trying to be “strong” at home. How many of us have had to replace “goodies” that we have sneaked out of the Christmas stock? Leave buying them until the last minute – there’s always plenty in the shops, you know, they’re not going to sell out! Make a list of everything you still had leftover when you put the decorations away last Christmas – now delete them off your shopping list for this year! Keep yourself busy. A lot of eating and drinking is done to relieve boredom. Make sure you always have something to do – have a good book to read, a jigsaw to do, or knitting or writing your Christmas cards, anything that will keep you busy. Exercise is important, so fit in as much as you can. It doesn’t have to be anything too strenuous, walking is great exercise. Look at stairs in a new light, they are a BIG calorie-burner. Did you know that every time you walk up a flight of stairs you burn off around 11 calories per minute! Why not put an exercise DVD or WiiFit on your Christmas list? Check out the classes locally for aqua aerobics, or Zumba, or Pilates. Combine exercise with your new healthy eating plan and you’ll soon be surprised at how fit you’re feeling. Above all, be realistic. Losing five pounds a month is an excellent weight loss – any more than that is a real bonus. And if you lose a pound a week, that’s 9lbs by Christmas and over 4 stone in a year! Let’s get going together and you’ll feel fitter, healthier and look fabulous for Christmas! 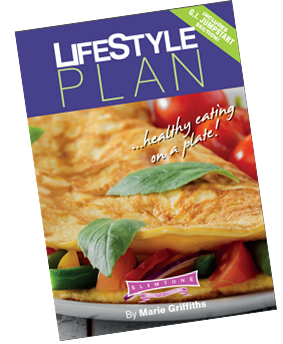 Grab your Lifestyle Plan now and get started today!